As a homeschool mom I am always on the search for quality children's books that can help me educate my children. And Wisdom Tales a children’s book publisher founded in 1980 and based out of Indiana provides such books. They publish both children and teen titles that share the wisdom, beauty, and values of traditional cultures and peoples from around the World. The content, illustrations, and production quality of the Wisdom Tale books makes them a lasting treasure for children, parents, teachers, and librarians. We received a copy of The Otter, The Spotted Frog & The Great Flood to review. This book is based off of a Creek Indian story. Both of my children love learning about other cultures. And my daughter has a fascination with Native American culture so I knew she would adore this book. The Otter, The Spotted Frog & The Great Flood is a beautifully illustrated 36 page hardback book. The book was written by Gerald Hausman and illustrated by Ramon Shiloh. The book is perfect for children ages 4-8 years old but younger and slightly older children will also enjoy this fabulous story. As I mentioned above the story is based on a traditional story from the Creek Indians of Northern Florida and Georgia. Gwyn immediately fell in love with the book before I even opened it to read it. She loved the animals on the cover especially the Otter (which is her daddy's favorite animal). She was even more excited when she found out it was a Native American story from the Georgia Creek Indians. The story provided my children with another cultures explanation of how the World and humans came to be. It also taught an important lesson about listening to the wisdom of nature and the environment. The story starts out on Day One with two animal people - Listener, a river otter and Honors Himself, a buffalo chief. They lived in village near a swamp and at night the frogs would sing but only Otter listened to them. 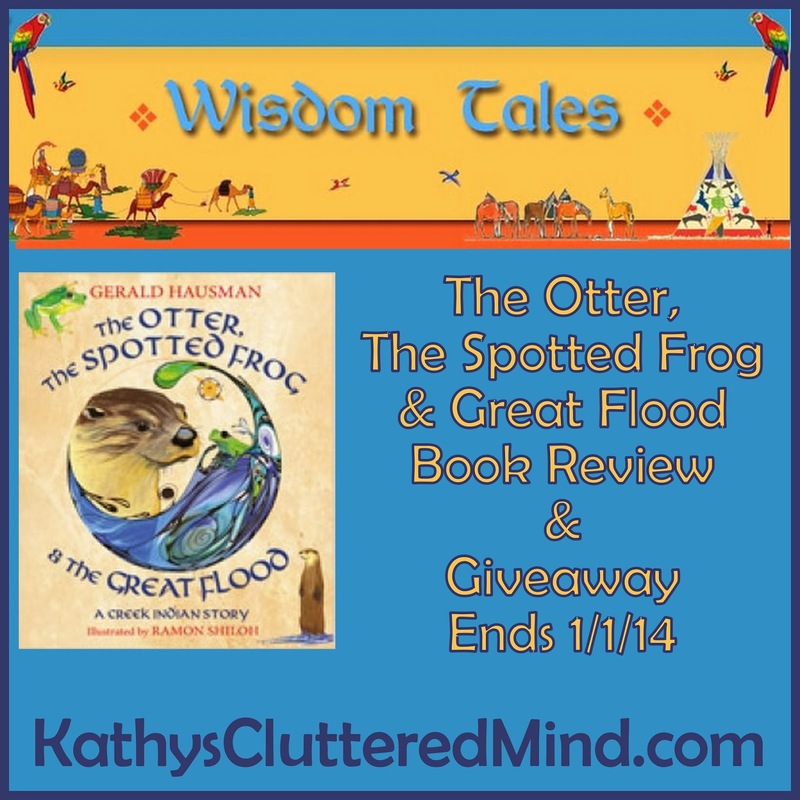 When Spotted Frog tells about the prophecy of a great flood that is about to destroy their homes, all of the animals ignore his warnings, except Listener the Otter. Despite being ridiculed by the other animals, Listener heeds Spotted Frog’s warning and begins to build a raft to save himself from the flood. The story follows Otter through Day Two as he builds the raft and continues to be ridiculed by the other animals, including Otter Woman. Otter continues his work and soon after his raft is built the rain begins to fall. The waters began to rise and soon the World was covered. Underneath Otter's raft which is tied to the tallest Oak Tree the sea animals swim. Above him the bird people fly and hook their claws into the bright dome in the sky to rest. Their tail feathers get soaked in the water and as a result the Hawks tail turns red and the Turkeys tail turns white. Day Three arrives and the waters begin to recede and Listener finds that he is the only Otter person left in the new World. But Spotted Frog ensures him to keep doing what he does best and listen. Otter soon finds himself a most interesting companion and on Day Four an interesting turn of events occur that ends with First Man and his wife becoming the first two-leggeds born into the World. The tale is full of Native American wisdom and was a great way teach my children about another culture. It had a great moral that our nature loving family could really appreciate and understand. And it was a great book for my daughter who really embraces the Native American people...actually she has claimed the book as her own and it has made a home on her bedroom bookshelf. My children loved the book and were engrossed the entire time I read. The illustrations were beautiful and you could really tell that there was a lot of thought put into each one. They had a hand painted look to them and each depicted exactly what the words were saying. My children loved examining the circular illustrations in particular. These illustrations showed the changing of the Earth from Day 1 through Day 4. Even the Indian Mounds (which we are very familiar with and have visited here in GA) are incorporated into the illustrations, and my children noticed this tiny detail. I really loved the Author's Note at the end of the book which provided more insight into this traditional Native American tale. We learned a lot about the origin of the tale and how the Creeks were probably influenced by some parts of the Biblical Genesis story and the oral tradition of the Scottish settlers. We also learned that different tribes had different versions of the story. This book is a fabulous addition to our book collection and will definitely be utilized over and over again during our creation myth and Native American unit studies. Be sure to visit the The Otter, The Spotted Frog & The Great Flood webpage to view sample pages and download a coloring page. There is also a great teacher and librarian page with videos and discussion guides. Gerald Hausman is the author of more than 70 books. His live storytelling has been praised by the Kennedy Center for the Performing Arts, History Channel, and the Bank Street College of Education. He and his wife live in FL and have received numerous awards in the field of children's literature. "As a writer I have often been called a scribe. This is because in the gathering of oral tales, I have always tried to get the story right. To capture the flavor, the region and the moral as the original storyteller gave it to me. The NYT Book Review called my collection of American Indian stories, Tunkashila 'an eloquent tribute to the first great storytellers of America.'" Ramon Shiloh is an author, illustrator and public speaker from Washington state. He worked with Rosa Parks and was honored with a certificate of appreciation for facilitator and storyteller for the underground Railroad Research Program: A Trail of Tears. He is dedicated to supporting art programs for children and Native youth. And he has produced and directed several planetarium shows as well. 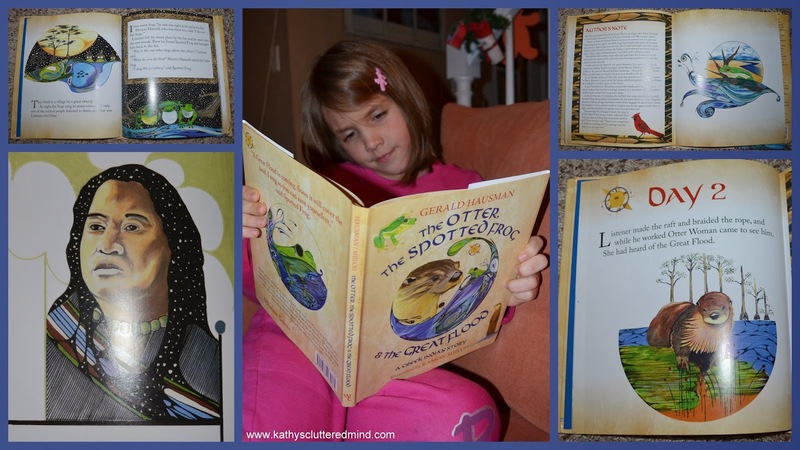 You can purchase The Otter, The Spotted Frog & The Great Flood on the website for $17.95 or from Amazon for $13.84. Wisdom Tales has graciously offered to giveaway a copy of the this amazing book to one lucky reader. Only the first entry is mandatory. Other entries are optional and give you extra chances. This giveaway is not affiliated with Facebook in any way. The winner will be posted on the blog and will be emailed. Winner must reply within 48 hrs with their contact information or another winner will be chosen. Prize will be mailed via the company. I love old Native American Legends about virtues we can learn from animals such as the coyote! We've been reading through Greek mythology and my kids love the stories! Their favorite is the Minotaur! We also love Aesop's fables and love reading our illustrated version of the fables. We really do not have a favorite. I like the modern Disney fairy tales of snow white and Cinderella. I also like to read creation myths. Oh, those look AWESOME! thanks for sharing!